40/20/40 split bench seats available on selected trims allow drivers to take advantage of extra passenger space or make room for bulky cargo. Upgrade the refined interior to include attractive European-sourced real wood accents that offer a smooth, elegant, durable finish to select trims. The available Uconnect with optional navigation, Apple CarPlay/Android Auto, and mobile entertainment puts connectivity right at the driver’s fingertips. RAM 1500 crew cab offers drivers access to in-floor storage for convenient placement of tools and equipment that need to remain out of sight. Schedule a test drive of the 2018 RAM 1500 and experience its stylish interior for yourself. 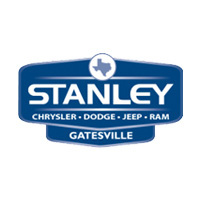 Contact Stanley Chrysler Dodge Jeep Ram Gatesville in Gatesville to get started!